To make the filling: Add the cream cheese, butter and sugar to the bowl of a stand mixer fitted with the paddle attachment. Beat on medium speed until well combined and smooth. Add the egg, flour and vanilla and continue beating just until incorporated. Set aside. Place the pecans on a rimmed baking sheet and toaste in the oven for 8-10 minutes, or just until fragrant. Remove the pan to a wire rack. In a large bowl, whisk the flour, both sugars, the cinnamon, salt, baking soda, nutmeg and allspice together. Add the eggs, oil, applesauce and vanilla and mix just until combined (I started with a whisk and switched to a rubber spatula). Fold in the toasted pecans and chopped apples until distributed throughout the batter. Spoon about 1/2 to 2/3 of the cake batter into the prepared 12-cup bundt pan. Top evenly with the cream cheese filling, leaving a 1-inch border around the edge of the pan (I found this tricky, just do the best you can). 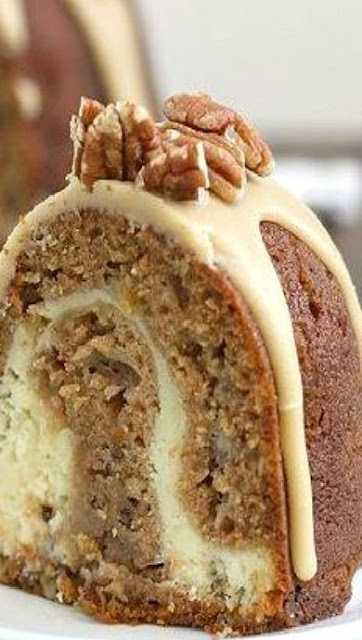 Use a thin paring knife to swirl the cream cheese filling with the cake batter just a few times - less is more. Top the filling with the remaining cake batter.